After celebs like Deepika Padukone, Aamir Khan and Alia Bhatt, Sonam Kapoor's rumoured boyfriend Anand Ahuja became the latest person to join team PadMan's challenge. 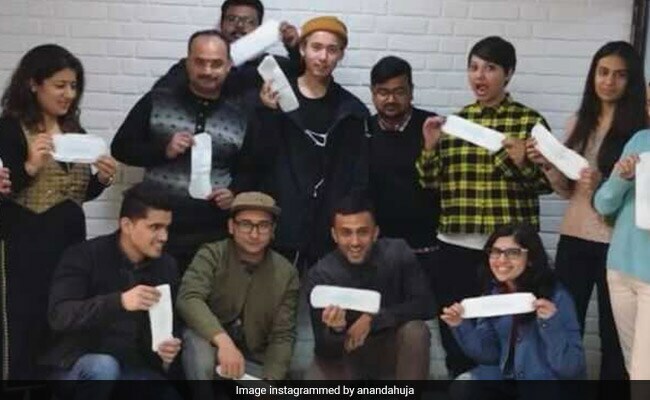 Anand Instagrammed a picture of himself with the team of Bhane (Anand's fashion label) holding sanitary pads in hands, rooting for Akshay Kumar's film, saying: "@bhanelove team and I got Pads in our hands. Nothing to be ashamed of. It's natural! Period." Recently, team PadMan started the film's promotion vis-a-vis the "PadMan challenge." Arunachalam Muruganantham, who is the subject of PadMan tagged the film's lead actor Akshay and producer Twinkle Khanna in the challenge, who in turn tagged three of their colleagues. Aamir Khan, Alia Bhatt, Karisma Kapoor and other celebrities have already completed the "PadMan challenge" including "Padmaavat" star Deepika Padukone. On Anand's picture, Sonam Kapoor, who also stars in PadMan commented: "My favs" while Sonam's father actor Anil Kapoor, who also completed the "PadMan challenge" wrote: "Mind blowing, love to your team Anand." Here's what Anand Ahuja posted on social media today. Karisma Kapoor, who was tagged by Madhuri Dixit, also posted a video of herself holding a sanitary napkin in her hand. Sonam Kapoor and Anand Ahuja have been rumoured to be dating for a while now. While the supposed couple have never officially acknowledged a romance, they often appear in each other's Instagram posts. Sonam will soon star in PadMan, which, as mentioned above, chronicles the struggles of Arunachalam Muruganantham, who invented a low cost sanitary pad making machine. Mr Muruganantham took the initiative to provide better menstrual hygiene conditions for the women of his family and those who could not afford sanitary pads. PadMan, directed by R Balki, also stars Radhika Apte. The film was earlier scheduled to hit the screens with Sanjay Leela Bhansali's "Padmaavat" on January 25th but Akshay, on request from "Padmaavat" director postponed the film to February 9.